Ahh, the 60s. The only time in modern history in which it was or ever will be a revered sartorial choice to wear flared striped pants, a tie-dye shirt, and a furry orange vest—all at once. Don't get us started on the glasses, the goatee, or the hair. Let's stick to below the neck, for the sake of time. ...Tambourines are cool! What was more unappealing, in hindsight? The ruffle and flair of the Victorian era? The simple garb of the Renaissance? Denim everything in the 90s? Probably not. Then again, we have it on good authority that fanny packs are making a comeback, so maybe we should just keep our lips zipped (be merciful with us, future generations). We're now going to ask some completely innocuous and non-judgmental questions. Do you own a pair of round, tinted spectacles? How about a pair of high-top shoes? Do you have time before your costume party to grow a handlebar mustache that might make Ron Swanson proud? 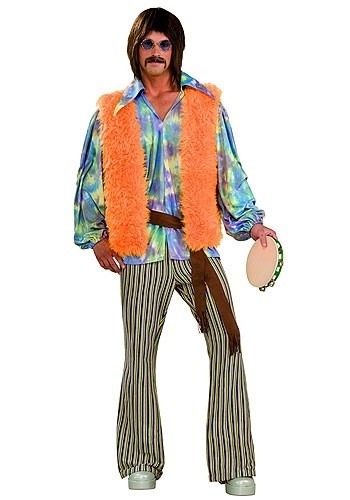 If you answered yes to two of the three, you would make an amazing one-half of the folk rock group Sonny and Cher—assuming, of course, you pair all that with this 60s Singer Costume. Serenade your hippie girlfriend with they lyrics of "I've got you babe" and she'll melt into your tie-dyed arms! Just don't mess with the hair, man.